Message 65140 - Posted: 14 Sep 2016, 4:45:49 UTC - in response to Message 65139. As far as I know, NONE of the Microsoft supplied video drivers support OpenCL. You need to install only the official graphic card vendor supplied drivers. Go to the AMD driver download site and grab the latest drivers directly from AMD. Also to prevent this from happening again with the Windows 10 automatic updates, set the automatic update to NOT update drivers. I have to agree to Keith Myers, but there is a problem with your HD 4xxx series cards and Windows 10. There are, and will never be, drivers from AMD for your HD 4xxx series cards for Windows 10. Check yourself on the AMD driver page. I brought online a computer with 3 HD 4850s. I run Windows 7 with the latest driver for the HD 4xxx series cards. (Catalyst 13.9) It seems to run quiet well from what i can see. Windows 8.1 is the lastest OS AMD supports drivers for. If you considering changing your OS. Or you could search for just the OpenCL SDK from AMD. But i am not sure if it still exists (it is integrated into the driver now), or if it will give the Microsoft drivers OpenCL support. I would give it a try before you remove your OS. Just want to give everyone a status update on the new separation version I am working on. I currently have it compiled for every platform except for Mac OSX. Our build machine we use for Mac decided it wanted to die so I am working on getting access to a new one. Until then, I might release without a Mac version on Monday, assuming the applications work during testing. If we are planning still planning to release on Monday, I will post again tomorrow to confirm. Thank you for the information Jake. However the GPU was detected correctly by Boinc, exept for the shown Gigaflops. They were around 3000 instead of nearly 6000. But i don't give too much about it, since the R9 280X GPUs are detected with the double Gigaflops they really have. zioriga, you said now your GTX 1080 is working correctly, but i haven't seen any valid workunits on your account. You have some units running, but not uploaded yet. Would like to see, if it runs correctly. I never get any Milkyway GPU tasks, BOINC never asks for them. My Milkyway account is set to take GPU tasks. My main computer has a decent Radeon R9 290, which happily does POEM, SETI, and Einstein tasks, but looking in the notes, BOINC has never requested Milkyway tasks for it. Any idea why? It always just says "requesting work for CPU". Message 65158 - Posted: 16 Sep 2016, 23:57:54 UTC - in response to Message 65157. Update: I just suspended the other 4 projects, and then BOINC did request GPU work from Milkyway (although there was none available at the time). Now Milkyway is way behind on points as it only gets my CPU, and I've given it much more weight than the others, but it will not ask for GPU work while the other projects are enabled. Any idea what's going on? Milkyway has a problem with GPU detection for newer cards than the R9 280X (HD 7970) You should get the same message i did, because Milkyway thinks you have another GPU. The good news is, that Jake is working on a solution to that problem. Message 65162 - Posted: 17 Sep 2016, 12:33:52 UTC - in response to Message 65159. 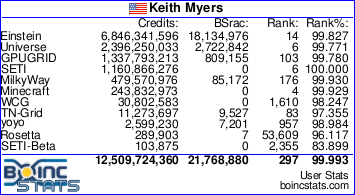 It seems to be a BOINC problem, which I accidentally fixed. Suspending the other four projects forced it to try to get GPU work from Milkyway. Then resuming them seems to have left it still asking. It keeps saying "Scheduler request completed: got 0 new tasks" which I assume just means there isn't any GPU work available just now. I get that sometimes with SETI - sometimes it gives me work and sometimes it doesn't. I don't get any message like yours. I do get complaints from another project on an old Nvidea which has drivers which are too old (newer drivers don't support that card), but not for Milkyway on my Radeon. Just got a bunch of N-body tasks that require 8 CPUs. WTF is that? 8 CPUs? Aborted them. Sent them back. Changed preferences. Message 65165 - Posted: 17 Sep 2016, 23:22:59 UTC - in response to Message 65164. I have PCs running 4 CPU tasks. If I had an 8 thread CPU (eg i7) I would allow those. What is the problem with it? I have an I7. Don't know what happened. Yesterday everything was working fine. Today, it is all screwed up. Switched back to GPU. Must have been a server glitch. Message 65167 - Posted: 18 Sep 2016, 9:36:26 UTC - in response to Message 65164. Your i7 CPU probably has 4 physical cores or 8 logical cores. It's normal to receive 8-threaded N-body tasks in that case. Message 65168 - Posted: 18 Sep 2016, 12:31:49 UTC - in response to Message 65167. The server seems to have slowed down. I can't cache enough WU's to keep busy! It always pauses 1 minute after each update and buy the time 1 minute expires, the WU's are already all done OR the setup requests more work and gets none/little several times in a row!!! 96338	Milkyway@Home	9/15/2016 3:30:38 AM	Sending scheduler request: To report completed tasks. Message 65169 - Posted: 18 Sep 2016, 15:09:45 UTC - in response to Message 65168. I can't get any at all. How do you get WUs for GPU on Milkyway? I'm running 5 projects, with no local cache, and every time it needs a new WU, Milkyway has none available, so it gets one of the others. I just tried sticking a 3+10 day cache on it, but all that happened is it rapidly downloaded loads of Einstein and SETI tasks. I have the weight for Milkyway ramped right up so it should take those in preference, but I never get any! I have 2 r9 290x cards that are not being picked up by Milkyway. However they do pick up when I run SETI which leads me to believe it is an issue with how Milkyway detects them any ideas on how to fix this so I can run the GPUs to help build the milky way ? Jake Weiss is working on the GPU detection issues. Currently no newer cards than the R9 280X or 7970 are detected by Milkyway@home. Nvidia cards seem to work well, as older AMD/ATI cards do. Message 65172 - Posted: 19 Sep 2016, 10:24:59 UTC - in response to Message 65171. You all keep saying they are "not detected" - how do you know the difference between not detected and no work available? I get no error message at all, just "got 0 new tasks", exactly the same as if there was no work available. I also have a very old Nvidia (Geforce 9500 GS) running, but that also says "got 0 new tasks". None of the GPU tasks are running for me. They all abort with "computation error" within a few seconds. This setup has worked previously with an older kernel and older NVIDIA driver. Eventually got the notice "ATI GPU R600 (R38xx) does not support OpenCL", so I assume I just wait for the fix for my R9 290.